St Marie’s Cathedral is a place of historical interest, beauty and peace. It is full of fine carving, sculptures and stained glass windows, much with hidden symbolism and meaning to be discovered. Why not come along and discover more about the Cathedral for yourself? We are now offering free guided tours every Wednesday at 2.30pm. 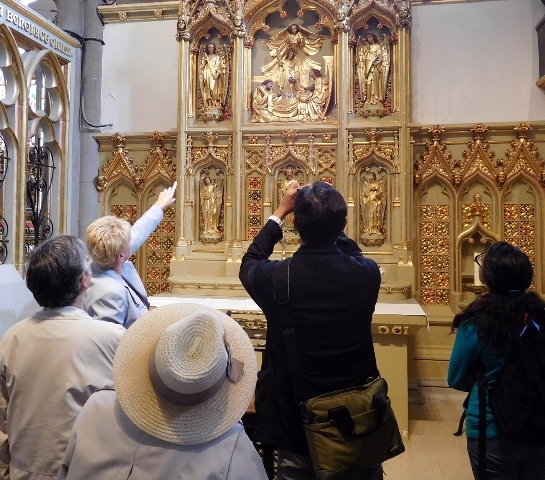 These fascinating tours are led by the cathedral’s experienced and knowledgeable guides. Drop-in tours: on the first Wednesday of each month at 2.30pm. Please meet your tour guide at the cathedral porch. Pre-booked tours: every Wednesday* at 2.30pm. To book please click here. Please note that bookings for Wednesday tours close on Mondays. *Booking not required on the first Wednesday of each month. We also welcome group visits and we would be delighted to tailor the tour specifically to your group’s interests. We would appreciate it very much if you could arrange your group to visit us on Wednesdays at 2.30pm. Please note that booking in advance is required (ideally two weeks ahead). If you would like to make a booking for your group please click here. If you have any questions or enquiries please email whatson@stmariecathedral.org. Please note: by emailing us, you consent to your submitted contact details being collected, stored and used by St Marie's Cathedral only for the purpose to contact us. Read more in our Privacy and Cookies Policy. Tours are free, but donations would be most welcome.